My wife and I love traveling and have been on a lot of trips in the US. We have found the trips we enjoyed the most were the ones we prepared well for and remembered to pack all the things we needed. So, we usually make a checklist of items to take either in a list app in iPhone or in a plain excel spreadsheet. We have an upcoming trip to California in a few weeks with 2 other families. 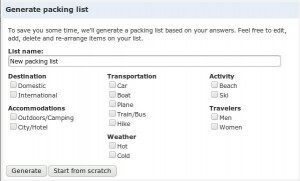 And I have found an excellent tool to create and share a packing list with our friends. No new user account needed – just login with your Google Account! Generates a comprehensive list of stuff based on yoru destination, means of trasportation, accommodation, weather and places. Even reminds you of things to do before you leave – charge batteries, upload mp3 to your player, take out trash, etc. That’s as simple as it gets for generating your packing lists. 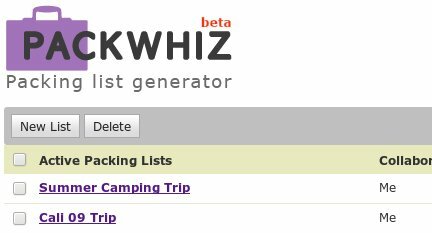 I have already started to create a packing list at PackWhiz for our California trip and will be sharing it with the friends we will be traveling. Wow, that’s a great application. I must try it. Thank you!